The JR Farm GrainleΒ Snack Plus Combi Pack contains three delicious varieties: Chamomile and Dandelion, Caraway and Dandelion, and Sage and Dandelion. Each snack is 100% grain free and contains no sugar ingredients. The natural mixtures of graΒes and tasty flowers are rich in natural vitamins and support dental abrasion and healthy digestion with their natural fibre content. 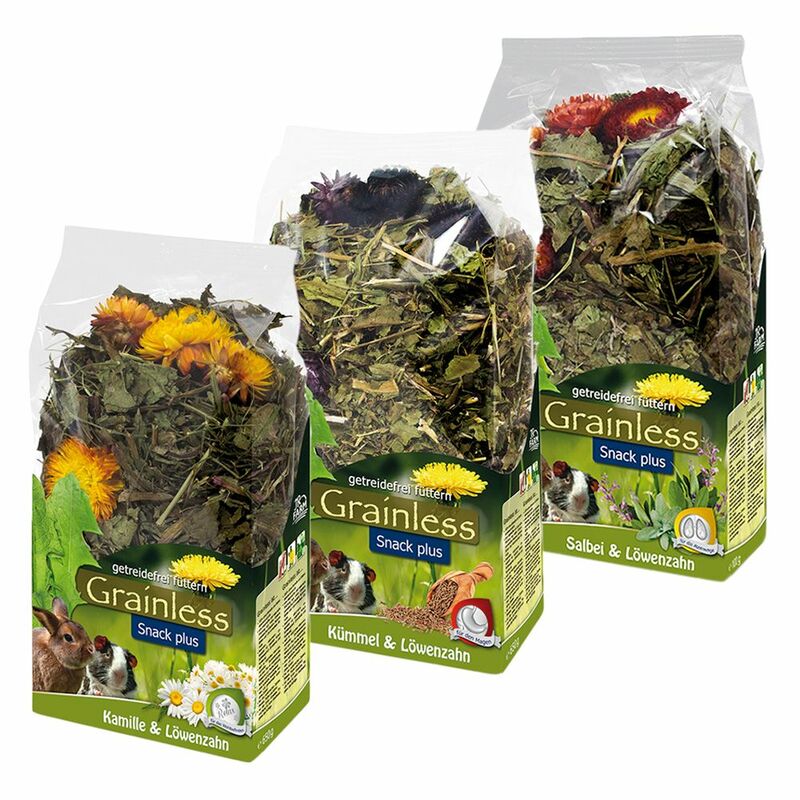 All three varieties contain dandelion as their main ingredient, which makes each mix a delicious treat for your pet. Chamomile can benefit your pets' relaxation and wellbeing. Caraway is great for the digestion, and sage can have positive effects on the airways. These grain free snacks make a perfect natural supplement to your pet's everyday diet. JR Farm GrainleΒ Snack Plus Combi Pack at a glance: Supplementary food for all small pets Contents: 100g Sage and Dandelion, 100g Chamomile and Dandelion, 100g Caraway and Dandelion. Grain free, free from sugar ingredients With tasty dandelion With chamomile: benefits wellbeing With caraway: can support digestion With sage: can have positive effects on the airways With no artificial colourings or flavouring.